Crumble (female) came into the rescue in Jan 2014 via one of the local RSPCA Inspectors. She had been living in poor conditions & was not handle much by her previous owner. We are unsure of her age. She was neutered Jan 2014, vaccinated & microchipped. She is a medium sized bun. 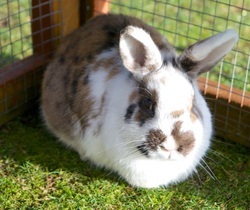 We are looking to re-home her with a neutered male bun.